Forget all those nasty chemicals you’re using to clean your home. Ewww. Luckily there are all-natural cleaning solutions which eliminate grease and grime! Baking Soda can handle that, and more. With these quick and easy tips, you can have your entire home sparkling clean from top to bottom, using nothing more than baking soda, seriously! If you have a slow-moving drain, before you consider pouring harmful chemicals down it, first try a mix of baking soda and vinegar. Pour a cup of baking soda down the drain, then next take a cup of vinegar, heat it up and pour it down the drain on top of the baking soda. Let it settle for roughly 10 minutes, and then flush it out with a pot of boiling water. Note: Only use this for slow drains, not fully clogged drains. If your stainless steel has lost its shine, avoid using harsh powder based cleaners as they may scratch the finish of your sink. Instead, scatter baking soda on a soft cloth and then buffing it will bring it back to life. After buffing, rinse thoroughly. When dealing with a dirty oven, it can be easy to reach for corrosive chemicals to overcome the serious cleaning challenge. However, instead, you can have the oven looking fresh by mixing up a concoction of baking soda, salt paste and water or vinegar. Put on some gloves and use a brush to spread the paste directly over the walls, floor and oven door. Be sure to let the blend sit for around 24 hours. Keep checking it is moist periodically, and add a spray of either vinegar or water if required. Burnt-on food will be softened by the paste which will allow scrubbing the oven to be easier. Wipe away the paste with a cloth or sponge, and turn on the oven to about 100 degrees. Leave it on for roughly an hour which will help any lingering residue to soften. Next turn off the oven, and once it’s cooled down, spray and rinse any stubborn stains and areas with some vinegar, then wipe it down. Yes, you can actually clean your toilets with baking soda, with just half a cup of baking soda, half a cup of borax and one cup of vinegar. First pour the vinegar onto the stains on the toilet, then sprinkle a mixture of baking soda and borax. Leave it to sit for 20 minutes, then scrub the toilet and flush. 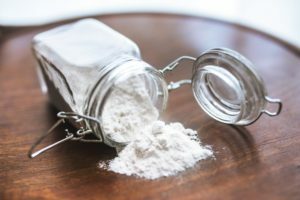 When you have that unaesthetic stain on the carpet or rug that just won’t come out, try sprinkling some baking soda over it to extract any excess moisture. First let it sit for 5-10 minutes, and then vacuum it up. Now it’s time to blot the stain using 1 tablespoon of vinegar mixed with 1 cup of small water. Be sure to work from the outer edges inwards. Keep blotting until the stain is no longer on the carpet, and then let it air dry. 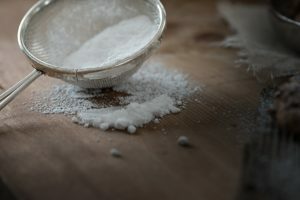 Baking soda with water combines to create a perfect mixture for wiping down and cleaning stains off the plastic and painted outdoor furniture, without being harsh. It also works great on outdoor fabric stains also. Over time it’s easy for all sorts of liquid spills and food scraps to start to pile up in your fridge and leave it grimy. Luckily a paste of dish soap and baking soda can remove all of those mishaps with ease. First, use a scrubbing sponge to reach any tough and stubborn spots. Next, using warm water, just wipe away the mixture. Afterwards, to make sure you get rid of all the nasty germs from your sponge, place it in the microwave for a couple of minutes. SnapClean is Australia’s leading professional home and domestic cleaning service. For the times when baking soda isn’t enough, let us give your house a professional clean from top to bottom!